Regenerative Medicine Today welcomes Joel Schuman, MD. 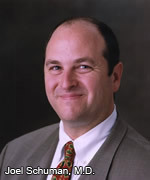 Dr. Schuman is the Eye and Ear Foundation Professor and Chairman of Department of Ophthalmology. He also serves as director of the UPMC Eye Center, and holds secondary appointments as a professor in Bioengineering at the University of Pittsburgh and professor, Center for the Neural Basis of Cognition, Carnegie Mellon University. Dr. Joel Schuman is considered to be one of the nation’s leading authorities on the treatment of glaucoma. Dr. Schuman’s research interests include imaging of the eye, laser-tissue interactions, aqueous outflow, and clinical pharmacology. In this interview, he disuses diaganostic imaging and describes a new initiative via the Center for Ocular Regeneration and Vision Restoration. Click here to learn more about Dr. Schuman’s program.